At a star-studded fashion event in Milan on Sunday night, the latest sustainable trends and innovation in fashion were on show at their luxurious best. 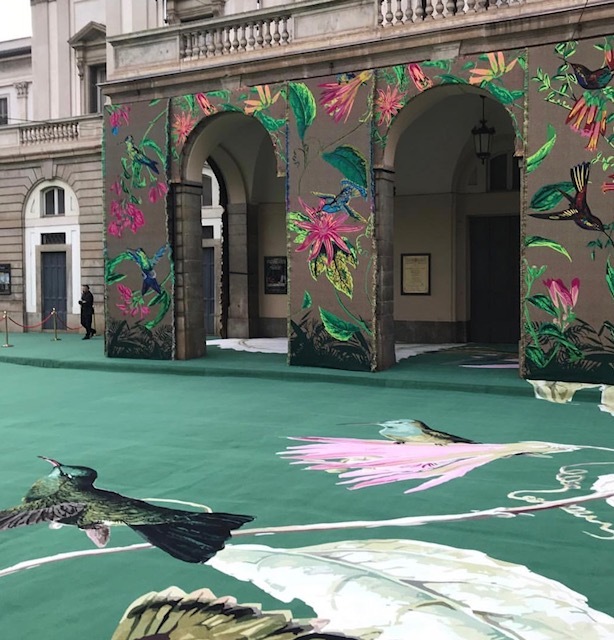 Gowns, dresses and suits made from handwoven palm straw, recycled polyester, organic silk, upcycled denim… were gloriously worn by stars, designers and fashion influencers at the Green Carpet Fashion Awards hosted by Camera Nazionale della Moda Italiana and Eco-Age. 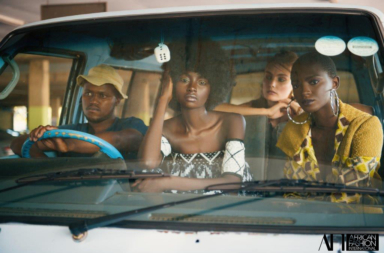 The two-year-old awards honour “both the handprint of fashion (the human capital that goes into the making of fashion apparel and accessories), and the footprint of fashion (the natural capital and environmental impact)”. The five finalists of the CNMI Green Carpet Talent Competitions were Davide Grillo, Behno, Gilberto Calzolari, Wrad and Teatum Jones. See the complete list of winners below. 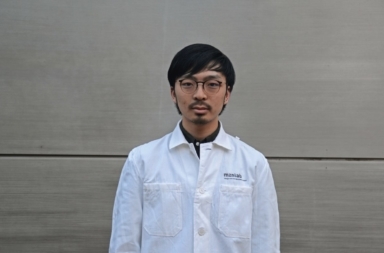 Hari presented the Frumat Leather with the Technology and Innovation Award for innovative textile technology in which apple waste is used to make a bio-based leather – solving both a waste problem and an ecological one. Hari wore a custom Gucci gown designed with sustainable sequins in recycled PET, featured in coloured stripes and multi-dimensional flower embroideries, and sustainably coloured beaded fringes made of glass bugles. Cate presented the Eco Stewardship Award to Australian woolgrowers. She wore Stella McCartney from the 2014 Green Carpet Collection, hand printed with certified water-based inks, certified sustainable wool and GOTS certified organic silk fabric. Cameron Russell Cameron was awarded the The Changemaker Award for using her social platforms for social good. She has systematically exposed harassment and mistreatment of models in the fashion industry through her social media campaign #MyJobShouldNotIncludeAbuse, leading to a series of important changes within the industry. Her gown is made of Canopy Style sustainable viscose, ensuring that the world’s ancient and endangered forests are not used to create fabrics. 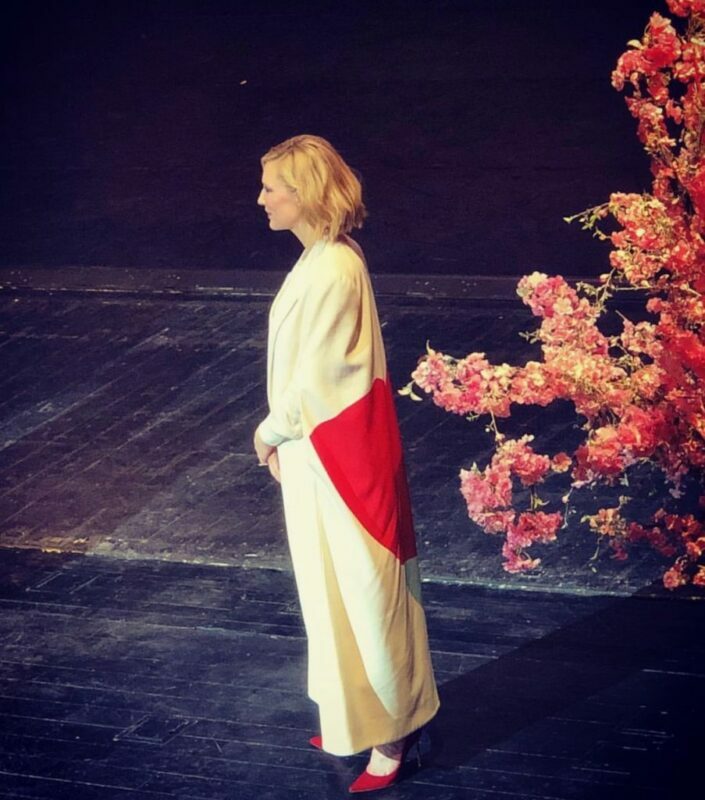 Alba wore a custom Valentino dress made from two types of repurposed certified organic silk produced by two historical Italian textile manufacturers. No new materials have been dyed nor produced to create this dress. 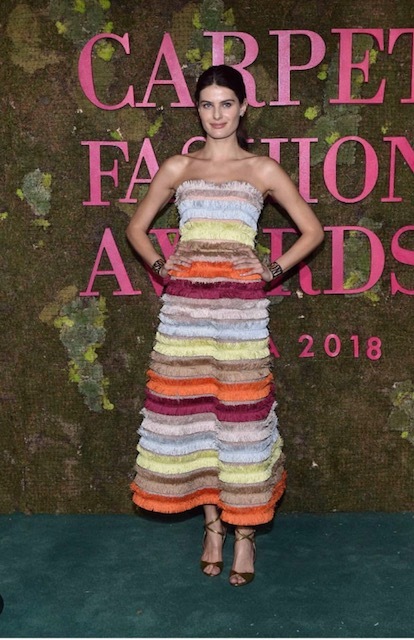 Isabeli wore a Missoni dress created using materials from the Missoni archive, and repurposed components from vintage Missoni prototype garments. See Eco-Age for all the information and many more pictures.